So last week I had my midterm exams/papers for my grad school classes, and things actually went pretty well. I definitely always get a little nervous about midterms and final exams because they mean that students have to remember tons of information and have multiple tests and assignments due during the same week. Stressful, right? 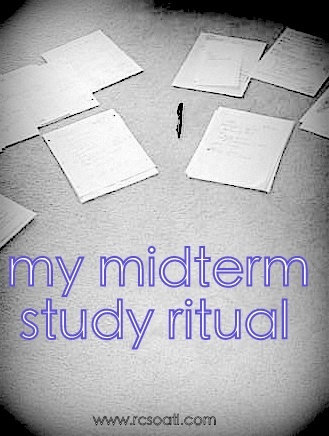 But over the years I've developed a midterm studying ritual of sorts that has really helped me get through midterm weeks without a ton of stress and with great grade results. Having a written list really helps keep me organized and also helps me prioritize my assignments. Trying to take on everything at the same time is very hectic and has proven unsuccessful for me in the past. So now, I stick to getting midterm studying and assignments done using a system. Study my most challenging courses first, review the ones I'm more comfortable with | I know different strategies work for different people, but I prefer to spend more time studying my more challenging midterms than I do studying for the classes I'm more comfortable with. Now, this does not mean completely skip studying your easy classes…that's the best way to be unpleasantly surprised by the material on an exam. This semester, I spent 3-4 days studying for my take-home (math) midterm and then used the entire 2 days we were allotted to complete my exam. And since I am more comfortable with policy since that is what I am studying in school, I started on that once I finished my math exam. So excited you're from ATL. I love coming across bloggers who also live in Atlanta. I have been trolling your blog's food section for the past 15 minutes, haha. I'm always looking for new restaurants to try. I already have a tonnnn of "must trys" on my list - and now I'm about to add a bunch more. good luck on those! i don't miss writing papers, midterms, or finals at all! the struggle! Good luck on your midterms! I think I've more often had assignments due than actual exams during midterms (thanks to my major), so it's never been a particularly more stressful time for me thank God, but good luck to everyone who has exams along with it! I love this post! I definitely don't miss midterms, but I'm thinking about going o grad school next year, so I'll be saving some of the tips from this post!